Hello, I have a 120 gallon tank with 2 Columbian catfish about 8 inches long. 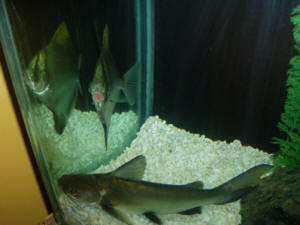 I also have 2 rainbow fish, an albino rainbow shark, 3 baby Bala sharks and a gourami. <Bit confused why you're keeping your Colombian Shark with freshwater fish. You do realise that Colombian Sharks will not be healthy (or happy) in freshwater? Adding enough salt to keep the catfish happy will kill the freshwater species. Furthermore, anything bite-sized is potential food. 1 of the catfish has developed a lump in its stomach overnight. He is eating and swimming alright. I feed him algae pellets, flakes, bloodworms, and shrimp pellets. Everyone else in the tank looks fine. I'll attach a picture. Please let me know if there is any way to help him. I've read through your catfish info, very helpful, but could use your opinion on this little guy/gal. I just got a new little one (about 2") and it's got a boo boo. & stress coat (not daily) for 5 days but it just doesn't seem to want to heal up. Today it's looking noticeably fluffy around the edges. The behavior isn't strange, it's happily cruising around the quarantine tank and is eating a little bit. It does look skinny to me and I have no idea if it's the injury messing with its appetite or it just wasn't getting enough food before I got it. Do I need to be worried about some nasty infection setting in here or do I just need to be more patient? Attached: Image capture from video of the injured spot. It's a little blurry. Would be easier if these guys held still for a second but go go go is what they do. Hi I have recently fell for the Columbian sharks and despite all the effort to keep them for years on end I am determined to keep them. I purchased 2 juveniles currently about 3 inches long they are in a freshwater aquarium at this current moment but I am in the process of picking up 2 more juveniles and a larger tank intended to be just for them. Also, my bigger one does this thing where he stares at me treading water than open and closes his mouth like in the photo...seems ok, right? So, SO glad to have found you. The "Expert" at That Fish Place in Lancaster, PA (they are supposed to be all that) tried convincing me that while they may do better in marine, they can completely adapt to freshwater, just as their "Mollie's" have done. He embarrassed me quite a bit I front of other customers, so conceded. I was increasing the salinity slowly, but as a result, began to decrease to obtain a freshwater habitat again. Well, he's wrong. Period. These guys started acting exactly as you've shared on your site. They most definitely need salt. Thank you!! 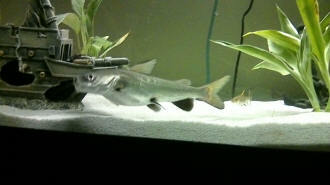 Sadly my silver tipped shark "Bluto", expired today after a valiant fight. I think fungus overtook him and had I read the information on this site earlier I am sure he would still be alive. While I was putting aquarium salt in the water each time I changed it, I am sure it wasn't enough to make it brackish. Further, the tank was too small and I likely didn't clean it as often as I should have. I had him for 3 and a half years and about 6 months ago his annoyance with fungus began. He was a big, beautiful healthy fish and my favourite. He will be missed. Thank you for sharing your knowledge about these good natured and lovely fish. If I get another one I will know how to take better care of him once he becomes an adult. 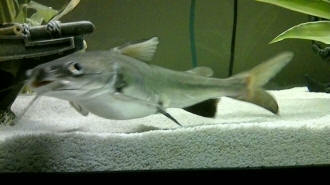 I have a 60 gallon bow front and 2-7" shark cats. I have had these 2 for a little over a year. Today when I arrived home from work they were both nearing death with scratches on them and what looks like a slime covering their body. All of their fins were shredded, swollen anuses, a film over their eyes, and these guys have been in great health up until today. About 3 weeks ago I lost my first fish in years in this tank. He was a 7" electric blue acai cichlid. I am concerned about what is causing this. I did a 50% water change, added some salt, and dosed the tank with Melafix. Symptoms are unnoticed until they are floating and I watch my fish nightly. I've been reading your website quite a bit for the past few months to learn more about my fish, and it's really helped me a lot. However, I haven't found a satisfying answer to a serious problem that I hope you can help me resolve. Three weeks ago, My house lost power during Irene for about a day and a half. My tank is a 75 gallon brackish setup (s.g. 1.008 at the moment, increasing it by about 0.001 each week with water changes) with two Columbian Shark catfish; one is 8 inches and the other is about 4. Ever since we got our power back, my bigger catfish has absolutely refused to eat, and his behavior has changed (though the smaller one seems completely fine). Rather than swimming peacefully with his tankmate, he thrashes around the tank frantically in tiny circles and is easily spooked. He also keeps opening his mouth really widely, as if he is yawning. and he is beginning to look emaciated. I have done everything I can possibly conceive to help persuade him to eat. I did a 50% water change that week on top of my usual weekly 1/3 water change and tested the water, but I haven't detected any ammonia or nitrite. Nitrate is about 40 last I checked, but that was before I did a 1/3 water change a few days ago. I gave him frozen bloodworms and squid, but he refused that too. I put activated carbon back in my filters this week after I read about the possibility of bad water being fed into the tank from the filters after the outage. So far, no change. Is it possible there is a toxin still in the water that is bothering him? Or maybe he has an infection or parasite? If so, what medicine should I give him? Could he have swallowed some gravel and it's lodged in his GI tract? If so, is there anything I can do to get it out or help him pass it (like a laxative)? <Epsom salt plus unshelled crustaceans such as whole krill and whole brine shrimp; these strict carnivores are unlikely to take peas, but it's worth a shot. Do bear in mind the whole Thiaminase issue with carnivores, and it's crucial their diet is balanced and doesn't include too many Thiaminase-rich foods. I'm running out of ideas and I'm desperate to help him however I can. 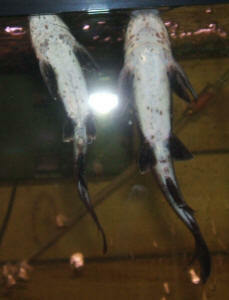 I am an owner of 2 Columbian sharks that I have bought about 3 months ago. I bought them from a small tropical fish store where the owner seemed to be very helpful to me as to setting up the tank. The sharks are about 4 1/2 in. now and have been in brackish water the whole time. The owner of the store told me that I do not need to keep track of the pH levels as long as I change the water once every month, which I have been doing consistently. 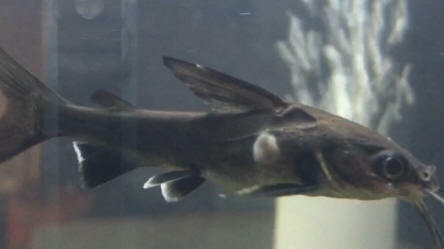 Recently, I bought an algae eater fish to go into the tank because the algae was becoming a problem. It has been doing fine. I also had an Ick problem, but just recently cleared that up. <If Ick/Whitespot can live in this tank, you ARE NOT adding enough salt. I feed them 1 cube of frozen blood worms a day, and they seem to like those very much. Just when I thought my sharks are nice and healthy, they start to act very strange. They are both continuously swimming forward towards the glass and won't stop until they eat. Sometimes, one sits in the bubbles(from the oxygen making thing) under the heater. That one also likes to go in a corner and put his nose in the corner of the tank while swimming straight up. Is this regular behavior? Or are they sick?? To answer your answer of the brackish water, the place I got them from told be to put 1 tablespoon of non iodized salt per gallon, do I need to increase the amount? water isn't brine. It's not water with a bit of salt added. It's a mix of freshwater and seawater, and the marine salt mix doesn't just add sodium chloride but also alkalinity and pH buffers. It's very different stuff. So the other Sciades Seemanni did die. The bulge in his stomach went away and he was swimming fine for a day. Then the reverse happened, his stomach started to look sunken in. One hour he was fine and dead the next. I think it was due to the quality of fish. I made the mistake of buying the fish at PetSmart. They must have had problems before I got them home. A couple days ago I went to a better fish store and picked up a new catfish. I acclimated him over 10 hours and he and the original cat in my tank are doing great. The big cat I have had for 2 years is tons more active and you can hear both fish grunting. I read the article about the Seemanni in the magazine. It was very informative. I do have one other question for you. I did a major cleaning in my tank before adding the smaller cats. The large Sciades Seemanni had a cloudy eye for a day and then it cleared up. The cleaning stirred up the tank and was fairly intense so it probably stressed the cat. I do not know if it was the cleaning or the addition of 2 small cats but the large cat rarely eats. He used to eat anything and everything, now I can barely get him to take silversides and krill. He has eaten a couple of krill in the past 2 weeks and only a few mixed pellets. The small ones are eating fine. The large one does not seem stressed but I can put a large silverside in front of him and he wants nothing to do with it. He used to go crazy for them. Any ideas as to what is going on? <Remind me again what the salinity is. Almost always, when brackish water fish go off their food, it's because they're not happy with the environment they find themselves in. At minimum, check the pH and the specific gravity. He is eating enough to survive...maybe, but maybe only a 5th or 10th of what he used to. Thanks guys. I only recently found wetwebmedia.com and am loving it. It is a great resource. (I decided they were the only fish I was going to keep). They are about 2 inches each, I felt bad at the petstore because they had these 5, about 10 pufferfish and 3 or 4 Monos in a 10 gallon tank. I bought all the sharks. I have them in a 30 gallon tank right now (and they are the only fish I have in there) and will be upgrading to a 90 gallon marine tank in about a year. They seem to be very happy with the swimming space for now, its quite a lot more then they are used to. (its not Ich) Last night the spot also had a white line down to his belly. upon closer inspection it looks like a few of the other fish have the start of a similar condition. The white line on Doug, seems to have all but disappeared, the spot is there still. I didn't know if this is a skin disease, I thought maybe it could be Columnaris? I've never had a fish with that before and looking at pictures online didn't help since the sharks are scaleless fish. I wanted to fix this problem as fast as possible, it would be silly to quarantine him since the rest of them have all been exposed and probably need treatment as well. My best guess is they didn't have marine salt in the water at the petstore, or not enough salt. I started the tank (for these guys) at 1.005 gravity and wanted to increase it gradually. Should I increase it faster (I don't know if that would help the skin problem). I'm trying to include a picture this morning (as an attachment).